If the Income declared in IT Return does not match with Form 26AS, then the ITD may serve the notice to the tax payer for arithmetical inaccuracies. The Tax Payer should submit either the revised return or submit the response to the query. The TDS claimed in the Tax return should match with the Form 26AS. Otherwise, the ITD may serve the notice on the tax payer to correct the TDS amount. 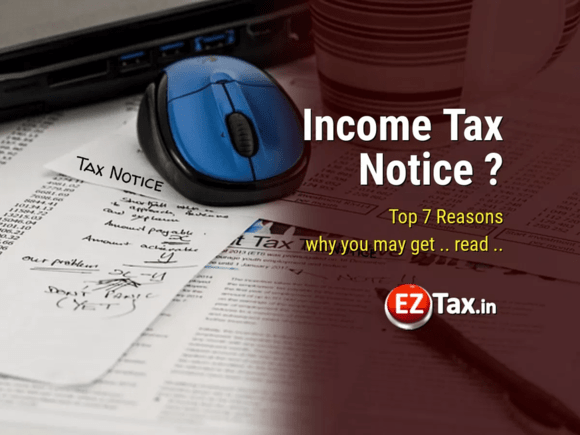 If the Tax payer have forgotten to include any income like interest, commission income etc., or claimed deductions under wrong sections or the information provided by the tax payer is incorrect, then there is a chance of notice by the ITD. The Tax Payer needs to correct it immediately. The Income Tax Department is randomly selecting the IT returns to be scrutinized. The Tax payers needs to upload the required documents within the time allotted by the ITD. If the tax payer has deposits of more than 2 Lakhs in bank, mutual funds investments of more than 2 Lakhs, Sale or purchase of Property etc needs to be reported to Income Tax Department. If not reported, then there is a chance of notice from the Income Tax Department. If the tax payer does not pay the Self-Assessment tax at the time of filing the return, then the ITD may serve a notice to the assessee requiring him to pay the tax. If the net profit from business / profession exceeds 1.2 lakhs, then Profit & Loss and Balance sheet should be filled. Otherwise the Income Tax return may be treated as defective. While Tax department do send the the notices in an email and possibly intimated thru SMSs, often times these were ignored due to the plethora of emails we get on a day-to-day basis. Hence EZTax.in recommends tax payers to visit ITD portal to see the noties yourself. or Speak to Team EZTax.in to get help. In case you want to see your IT notices on your own, visit How to see your IT Notices ?